A tartan is defined by its unique “sett” - a pattern of criss-cross lines of various widths in particular colours. These colours are traditionally recorded quite loosely, such as “dark green”. This leaves plenty of room for interpretation! Over the years, tartan weavers have developed a conventional set of colour treatments, with names like ‘Modern’, ‘Ancient’, or ‘Reproduction. 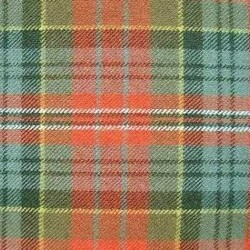 In fact ‘Buchanan Modern‘ and ‘Buchanan Ancient‘ are the same tartan, woven with alternative hues for different visual effects. This is purely an aesthetic difference, and which you prefer is a matter of taste. We show some examples below. Different weavers will also interpret these shades differently, so the ’same’ tartan from two different mills can look very different. The same tartan in distinct materials such as wool or silk, or even different weights of wool, can also look quite different. And do remember that computer monitors never represent fabrics accurately. We always recommend ordering a fabric or yarn sample first if the exact shade matters to you. Before the twentieth century, almost all dying was with vegetable dyes. The advent of chemical dyes in the mid-1800s introduced the possibility of stronger and brighter shades, which became immediately popular, appealing to Victorian sensibilities with their liking for strong colour schemes. 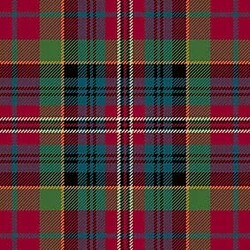 Tartans woven in ‘Modern Colours’ are characterised by darker and more vivid shades. However, blacks, greens, and blues, can be so dark as to make the sett pattern hard to distinguish (notably in the Black Watch tartan) resulting in an attractive subtlety, or loss of detail, depending on your preference. Ancient tartan colours are lighter in tone, as if aged by years of exposure to light. Ironically, Ancient colours are a more recent invention than Modern colours, becoming popular in the 1950s and ’60s. Weavers began to create lighter toned variants of the then fashionable Modern tartans only once the novelty of such strongly toned dyestuffs had started to ebb, and a fashion re-emerged for older-looking colours. A tartan’s sett (pattern) will often be easier to distinguish in Ancient tones than in Modern colours, due to the lighter shades used. 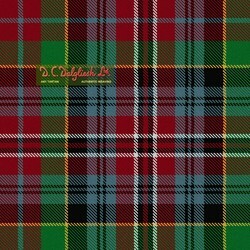 A fragment of tartan cloth more than two centuries old, dug up from the historic Culloden Moor in 1946, gave birth to the D.C. Dalgliesh Reproduction range. Careful analysis and research into the original dyes led to a range of tartans which are designed to be authentic in colour and design to those worn in 1745 and before. They have a soft muted effect reminiscent of the days when vegetable sources such as lichen, moss and alder bark provided the dyer with his raw materials. These are probably the most historically authentic tartans on the market. 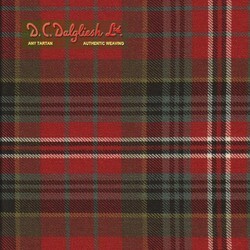 Such was the success of the Reproduction range by D.C. Dalgliesh, that other weaving mills sought to follow suit with their own ranges of authentic looking tartans. These became known as Weathered tartans, made to look as vegetable-dyed fabrics have faded after exposure to the elements for years, with an overall hue leaning towards the browns. Blues and greens become greys and browns. Think of weathering like the effect of once-vibrantly green autumn leaves on the forest floor. As the name suggests, Muted Colours are just the same colours as in the Standard set, but with less saturated tones for a gentler and more muted effect. Some say that these muted colours hark back to the vegetable dyes of old, but in reality they are another modern invention designed to appeal to contemporary aesthetics through their more subdued tones. Where we display a tartan in ‘Standard Colours’ it uses yarns from a particular weaver that are as close as possible to the shades defined for that colour in the official archives (normally the Scottish Register of Tartans). 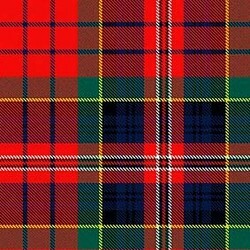 In other words, this is as close to the officially recorded tartans as possible that the weaver could produce without resorting to special dyeing. What are the steps of tartan selection? 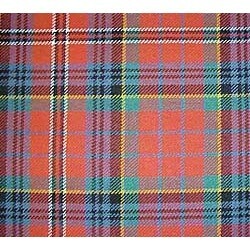 What are “Custom Design” tartans?